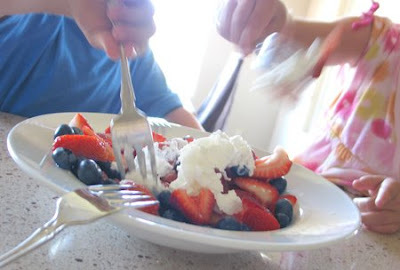 Dessert at our house often looks like this: Assorted berries of the season (strawberries, blueberries, raspberries, blackberries) and bananas ... topped with whipped cream ... one big bowl ... FOUR forks ... ready ... dig in!!!!!! When Daddy makes it, we also add cashews and melted dark chocolate. Our kids love sitting together at the kitchen island & sharing, so it's healthy, fun and easy peasy! What's your favorite "healthy" family dessert/treat? A healthy dessert we eat here? Hmm. The little ones love their yoghurt (just plain yoghurt) with fruit. Doesn't matter what kind of fruit, as long as it's fruit. Peaches and pineapple are their favorites. And lately, we often have large slices of Galia Melon (do you call it a Galia melon in English too?) as a dessert. We all love that. It's so sweet. Yumm! Hmm, I think I'm going to skip my bread for breakfast. I'm having fruit! Oh that looks so divine!! and... healthy!!!! YUMMY!!! 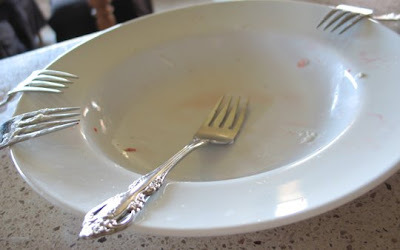 Gosh, that looked so yummy! And to think I just baked a Barefoot Contessa dessert recipe. Not the most low calorie treats but every recipe of hers is delicious. 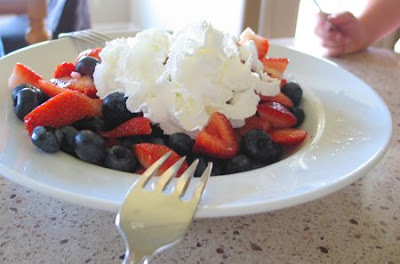 But on a healthy note, I love fresh fruit, especially berries when they are in season. I also enjoy raspberry sorbet. It's light and refreshing particularly in the summer months. 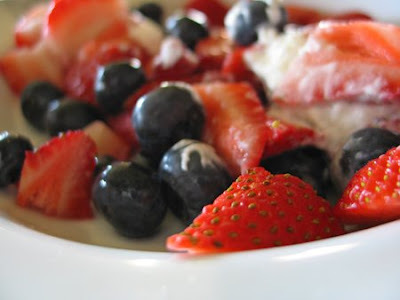 Don't tell on me...but when I'm eating fruit and being naughty, I skip the whipped cream and use sweetened condensed milk. Shhh...don't tell. Life really should be more about enjoying the good stuff like fresh fruit and fun times with the family. Thanks for the reminder of the beauty of every day moments. Pearl Maple - I loved your note! I am trying very hard this summer to just focus on my two little kiddos and enjoy their big wonder and joy over the little things! Lovely beautiful photos! Makes me want to make some. I adore peach cobbler and haven't made it yet this season. Time to get baking! This looks like something i would love. For me -- summer says-- Watermellon. This inspires me to make dessert more often. I so often save it for a special night when every night is special enough for something this good! so yummy! as they say, waste not, want not... I would definitely eat it all up too! Its yummy!!!! !Lovely beautiful photos!!! !i love it ...it looks yum yum!!! !